Free public WiFi is now available at West Cumberland Hospital and at the North Cumberland Infirmary at Carlisle. Free public Wi-Fi available to all patients and visitors was launched at North Cumbria University Hospitals NHS Trust (NCUH) shortly before Christmas (Monday 18 December). The Trust was one of only 16 in the country to take part in the initial phase of NHS Digital’s plans for free Wi-Fi in all NHS healthcare settings and IT staff have been working to introduce the new system before Christmas. 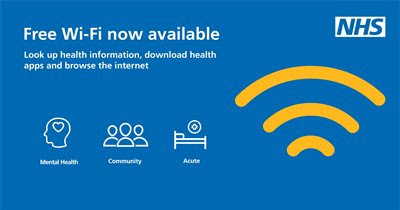 The Wi-Fi now available at both The Cumberland Infirmary in Carlisle and West Cumberland Hospital in Whitehaven and means that patients and visitors will be able to browse the internet and use apps while at either hospital. Patients just need to choose ‘NHS Wi-Fi’ on their smart device and follow the registration process to gain access. Cumbria Partnership NHS Foundation Trust (CPFT) and North Cumbria Clinical Commissioning Group will also be using the new system in their hospitals and GP practices, switching from their current supplier in the New Year. Michael Smillie, executive director of IT for NCUH and CPFT, said: “Being in hospital can sometimes be isolating and being able to go online for free, using their own devices, will allow patients to stay up to date with news, access social media, keep in touch with family and friends and browse the web.